What are risk factors for rosacea? What happens to the nose? What happens to the eyes? What about using acne medicine? What is used for treating rosacea? What foods are good for rosacea? What natural or home remedies can help rosacea? Does rosacea get worse with age? How should I care for the skin of my face? How are the telangiectasias (the red lines) treated? How is a rhinophyma (the W.C. Fields nose) treated? What effect may rosacea have on my life? Rosacea (roz-ay-sha) is a very common red, acne-like benign skin condition that affects many people worldwide. As of 2010, rosacea is estimated to affect at least 16 million people in the United States alone and approximately 45 million worldwide. Most people with rosacea are Caucasian and have fair skin. The main symptoms of rosacea include red or pink patches, visible tinybroken blood vessels, small red bumps, red cysts, and pink or irritated eyes. Most people with the disease may not even know they have rosacea or that it is a diagnosable and treatable condition. Many people who have rosacea may just assume they blush or flush easily or are just very sun sensitive. .
Rosacea is considered a chronic (long-term), non-curable skin condition with periodic ups and downs. As opposed to traditional or teenage acne, most adult patients do not “outgrow” rosacea. Rosacea characteristically involves the central region of the face, causing persistent redness or transient flushing over the areas of the face and nose that normally blush — mainly the forehead, the chin and the lower half of the nose. It is most commonly seen in people with light skin, and particularly in those of English, Irish and Scottish backgrounds. Some famous people with rosacea have included former President Bill Clinton and W.C. Fields. The redness in rosacea, often aggravated by flushing, may cause small blood vessels in the face to enlarge (dilate) and become more visible through the skin, appearing like tiny red lines (called telangiectasias). Continual or repeated episodes of flushing and blushing may promote inflammation, causing small red bumps that often resemble teenage acne. In fact, rosacea can frequently be mistaken for common acne. Rosacea is also referred to as acne rosacea. Rosacea is basically different than acne, although the two can coexist. It is also sometimes called “adult acne.” Unlike common acne, rosacea is not primarily a plague of teenagers but occurs most often in adults (ages 30 to 50), especially those with fair skin. Different than acne, there are usually no blackheads or whiteheads in rosacea. Furthermore, most teens eventually outgrow acne whereas patients with rosacea don’t generally outgrow it. Rosacea consists mostly of small red bumps that are not “squeezable” or extractable like blackheads. Squeezing a rosacea pimple usually causes a scant amount of clear liquid to expel. Unlike traditional acne where professional extractions can help remove whiteheads and blackheads, squeezing or extracting rosacea bumps does not help improve the rosacea. People with rosacea individuals tend to have a rosy or pink color to their skin as opposed to acne patients whose skin is usually less red. Rosacea strikes both sexes and potentially all ages. Overall, it tends to be more frequent in women but more severe in men. It is very uncommon in children, and it is very infrequently seen in darker skin tones or black skin. Overall, it is seen in light-featured adults between 30-50 years of age. The exact cause of rosacea is still unknown and remains a mystery. The basic process seems to involve dilation of the small blood vessels of the face. Suspected causes of rosacea include but are not limited to genetic factors, genetics plus sun exposure, a mite sometimes found in hair follicles (Demodex folliculorum), the bacteria Helicobacter pylori (that is associated with stomach ulcers), gastrointestinal disease, and medications that cause blood vessels to widen. There seems to be a hereditary component to rosacea in a large number of people. Often people have close family members with rosacea. Rosacea tends to affect the “blush” areas of the face and is more common in people who flush easily. Additionally, a variety of triggers are known to cause rosacea to flare. Emotional factors (stress, fear, anxiety, embarrassment, etc.) may trigger blushing and aggravate rosacea. A flare-up can be caused by changes in the weather like strong winds or a change in the humidity. Sun exposure and sun-damaged skin is generally associated with rosacea. Exercise, alcohol consumption, emotional upsets, and spicy food are other well-known triggers that may aggravate rosacea. Many patients may also notice flares around the holidays, particularly Christmas and New Year’s holidays. Rosacea risk factors include fair skin, English, Irish or Scottish heredity, easy blushing, and having other family members with rosacea called “positive family history”. Additional risk factors include female gender, menopause, and adults in the age range 30-50years old. No. Rosacea is not considered contagious or infectious. There is no evidence that rosacea can be spread by contact with the skin, sharing towels, or through inhalation. Typical signs and symptoms of rosacea include facial flushing, blushing, redness, burning, red bumps, and small cysts. The symptoms tend to come and go. The skin may be clear for weeks, months, or years and then erupt again. Rosacea tends to evolve in stages and typically causes inflammation of the skin of the face, particularly the forehead, cheeks, nose, and chin. When rosacea first develops, it may appear, then disappear, and then reappear. However, the skin may fail to return to its normal color and the enlarged blood vessels and pimples arrive in time. Rosacea may rarely reverse itself. Rosacea generally lasts for years, and, if untreated, it tends to gradually worsen. Rosacea is usually diagnosed based on the typical red or blushed facial skin appearance and symptoms of easy facial blushing and flushing. Rosacea is largely under diagnosed and most people with rosacea often do not know they have the skin condition. Many people may not associate their intermittent flushing symptoms with a medical condition. The facial redness in rosacea may be transient and come and go very quickly. Dermatologists are physicians who are specially trained in the diagnosis of rosacea. Generally no specific tests are required for the diagnosis of rosacea. In unusual cases, a skin biopsy may be required to help confirm the diagnosis of rosacea. Occasionally, a non-invasive test called a skin scraping may be performed by the dermatologist in the office to help exclude a skin mite infestation by Demodex which can look just like rosacea. A skin culture can help exclude other causes of facial skin bumps like staph infections or herpes infections. Blood tests are not generally required but may be used to help exclude less common causes of facial blushing and flushing including lupus, other autoimmune conditions, and dermatomyositis. The nose is typically one of the first facial areas to be affected in rosacea. It can become red and bumpy and develop noticeable dilated small blood vessels. Left untreated, advanced stages of rosacea can cause a disfiguring nose condition called rhinophyma (ryno-fy-ma), literally growth of the nose, characterized by a bulbous, enlarged red nose and puffy cheeks (like the old comedian W.C. Fields). There may also be thick bumps on the lower half of the nose and the nearby cheek areas. Rhinophyma occurs mainly in men. Severe rhinophyma can require surgical correction and repair. Some people falsely attribute the prominent red nose to excessive alcohol intake, and this stigma can cause embarrassment to those with rosacea. Although a red nose may be seen in patients with heavy alcohol use, not every patient with rosacea abuses alcohol. Rosacea may or may not affect the eyes. Not everyone with rosacea has eye issues. A complication of advanced rosacea, known as ocular rosacea, affects the eyes. About half of all people with rosacea report feeling burning, dryness, and grittiness of the eyes (conjunctivitis). These individuals may also experience redness of the eyelids and light sensitivity. Often the eye symptoms may go completely unnoticed and not be a major concern for the individual. Many times, the physician or ophthalmologist may be the first one to notice the eye symptoms. Untreated, ocular rosacea may cause a serious complication that can damage the cornea, called rosacea keratitis. An ophthalmologist can assist in a proper eye evaluation and prescribe rosacea eye drops. Oral antibiotics may be useful to treat skin and eye rosacea. Untreated eye rosacea may cause permanent damage, including impaired vision. Rosacea is currently not considered a curable condition. While it cannot be cured, it can usually be controlled with proper, regular treatments. There are some forms of rosacea that may be significantly cleared for long periods of time using laser, intense pulse light, photodynamic therapy, or isotretinoin (Accutane). Although still not considered a “cure,” some patients experience long-lasting results and may have remissions (disease-free period of time) for months to years. Since there is some overlap between acne and rosacea, some of the medications may be similar. Acne and rosacea have in common several possible treatments including (but not limited to) oral antibiotics, topical antibiotics, sulfa-based face washes, isotretinoin, and many others. It is important to seek a physician’s advice before using random over-the-counter acne medications since they can actually irritate skin that is prone to rosacea. Overall, rosacea skin tends to be more sensitive and easily irritated than that of common acne. There are many treatment choices for rosacea depending on the severity and extent of symptoms. Available medical treatments include antibacterial washes, topical creams, antibiotic pills, lasers, pulsed-light therapies, photodynamic therapy, and isotretinoin. Mild rosacea may not necessarily require treatment if the individual is not bothered by the condition. More resistant cases may require a combination approach, using several of the treatments at the same time. A combination approach may include home care of washing with a prescription sulfa wash twice a day, applying an antibacterial cream morning and night, and taking an oral antibiotic for flares. A series of in-office laser, intense pulsed light or photodynamic therapies may also be used in combination with the home regimen. It is advisable to seek a physician’s care for the proper evaluation and treatment of rosacea. With the proper treatment, rosacea symptoms can be fairly well controlled. Popular methods of treatment include topical (skin) medications applied by the patient once or twice a day. Topical antibiotic medication such as metronidazole applied one to two times a day after cleansing may significantly improve rosacea. Azelaic acid (Finacea gel 15%) is another effective treatment for patients with rosacea. Both metronidazole and azelaic acid work to control the redness and bumps in rosacea. Some patients elect combination therapies and notice an improvement by alternating metronidazole and azelaic acid: using one in the morning and one at night. Sodium sulfacetamide (Klaron lotion) is also known to help reduce inflammation. Other topical antibiotic creams include erythromycin and clindamycin (Cleocin). Clindamycin gel, solution, or lotion (Cleocin). Oral antibiotics are also commonly prescribed to patients with moderate rosacea. Tetracycline, doxycycline, minocycline, and amoxicillin are among the many oral antibiotics commonly prescribed and they actually help reduce inflammation and pimples in rosacea. A newer low dose doxycycline preparation called Oracea 40mg once a day has been used in rosacea. The dose may be initially high and then be tapered to maintenance levels. Common side effects and potential risks should be considered before taking oral antibiotics. Short-term topical cortisone (steroid) preparations of minimal strength may in occasional cases also be used to reduce local inflammation. Some mild steroids include desonide lotion or hydrocortisone 0.5% or 1% cream applied sparingly once or twice a day just to the irritated areas. There is a risk of causing a rosacea flare by using topical steroids. Prolonged use of topical steroids on the face can also cause Perioral dermatitis. Some doctors may also prescribe tretinoin (Retin-A), tazarotene (Tazorac), or adapalene (Differin) which are prescription medications also used for acne. Rarely, permethrin (Elimite) cream is prescribed for rosacea cases that are associated with skin mites. Permethrin is also used for the body mites that cause scabies. Isotretinoin is infrequently prescribed in cases of severe and resistant rosacea. Often it is used after multiple other therapies have been tried for some time and have failed. It is used as a daily capsule for 4-6 months. Isotretinoin is not typically used in rosacea and it is most commonly used in the treatment of severe, common acne called acne vulgaris. Close physician monitoring and blood testing are necessary while on isotretinoin. Typically at least 2 forms of birth control are required for females on this medication and pregnancy is absolutely contraindicated while on isotretinoin. In addition, prescription or over-the-counter sensitive skin cleansers may also provide symptom relief and control. Harsh soaps and lotions should be avoided, whereas simple and pure products such as Cetaphil or Purpose gentle skin cleanser may be less irritating. Patients should avoid excessive rubbing or scrubbing the face. Many patients are now turning to laser and intense-light treatments to treat the continual redness and noticeable blood vessels on the face, neck, and chest. Often considered a safe alternative, laser and intense pulse-light therapy may help to visibly improve the skin and complexion. Laser treatment may cause some discomfort. While most patients are able to endure the procedure, ice packs and topical anesthetic cream can help alleviate the discomfort. Multiple treatments are typically necessary and the procedure is not covered by most insurances. Treatments are recommended in three- to six-week intervals; during this time, sun avoidance is necessary. Risk, benefits, and alternatives should be reviewed with your physician prior to treatment. Laser treatments may be combined with photodynamic therapy (light-activated chemical using Levulan) for more noticeable results. Photodynamic therapy (PDT) is one of the newly available treatments. PDT uses a topical photosensitizer liquid that is applied to the skin and a light to activate the sensitizer. Levulan (aminolevulonic acid) and blue light, commonly used to treat pre-cancers (actinic keratosis) and acne vulgaris, can also be used to treat some rosacea patients. The use of PDT in rosacea is considered off-label use to some extent, since it is primarily designed for regular acne. PDT is thought to work at reducing the inflammation, pimples, and also improving the skin texture. PDT is an in-office procedure performed in your physician’s office. The treatment takes anywhere from one to one and a half hours to complete. Strict sun avoidance for approximately one to three days is required after the treatment. Mild discomfort during the treatment and a mild to moderate sunburn appearance after the treatment is common. Some patients have experienced remissions (disease free periods) of several months to years from these types of treatments. Other patients may not notice significant improvement. Glycolic-acid peels may additionally help improve and control rosacea in some people. The chemical peels can professionally be applied for approximately two to five minutes every two to four weeks. Mild stinging, itching, or burning may occur and some patients experience peeling for several days after the peel. Any peel can irritate very sensitive skin and cause flares for some people. Peels should be used with caution in rosacea as not everyone is bale to tolerate these treatments. Sun exposure is a well known flare for many rosacea sufferers. Sun protection using a wide-brimmed hat (at least 6 inches) and physical sunscreens (like zinc or titanium) are generally encouraged. Because rosacea tends to occur in mostly fair-skinned adults, the use of an appropriate daily sunscreen lotion and overall sun avoidance is recommended. Zinc-based sunscreens (SPF 30 or higher) provide superior sun protection. While not all rosacea people are exactly the same, there are some common rosacea triggers. Avoiding these potential triggers may also help relieve symptoms and disease flares. It may be helpful to keep a personal diary of foods and other triggers that flare rosacea symptoms. Smoking, spicy foods, hot drinks, and alcohol may cause flushing and should be avoided. Exposure to sunlight and to extreme hot and cold temperatures should be limited as much as possible. Red wine and chocolate are two well known rosacea triggers. Some listed foods may have no effect on your rosacea but severely affect someone else. Individual reaction patterns vary greatly in rosacea and therefore a food diary may help to elucidate your special triggers. Potent cortisone or steroid medications on the face should be avoided because they can promote widening of the tiny blood vessels of the face. Some patients experience severe rosacea flares after prolonged use of topical steroids. Vasodilator pills can also flare rosacea. Vasodilators include several blood pressure medications like nitrates, calcium channel blockers, and thiazide diuretics. These potential triggers are found in many skin cleansers and should be avoided in rosacea. Foods that help avoid rosacea flares include less spicy meals, non-alcoholic cool beverages, caffeine-free drinks, non-dairy cheese, and thermally cooler meals. What natural remedies can help rosacea? Rosacea skin tends to be fairly sensitive and may easily flare with self treatment or common acne therapies. Any home treatment or attempts for natural remedies should be approached with mild caution. As with any rosacea therapy, some people may experience sensitivity or irritation with treatment. Several possible natural remedies including dilute vinegar cleansing and green tea applications may be useful in rosacea. Dilute white vinegar facial soaks or cleansing daily or weekly using approximately 1 part regular table vinegar to 6 parts water may be helpful. Vinegar is thought to help as a natural disinfectant and can help decrease the number of yeasts and bacteria on the skin. Since vinegar may flare rosacea in some people, a small test area should be tries before applying to the entire face. Green tea soaks to the face may also help decrease the redness and inflammation seen in rosacea. Green tea is thought to have anti-inflammatory properties. A few commercially available products also use green tea as the active ingredient. Yes. Although rosacea has a variable course and is not predictable in everyone, overall it tends to gradually worsen with age, especially if untreated. In small studies, many rosacea sufferers have reported that without treatment their condition had advanced from early to middle stage within a year. With good therapy, it is possible to prevent progression of rosacea. Proper skin care involves using a gentle cleanser to wash the face twice a day. Over-washing may cause irritation. A sunscreen lotion is advisable each morning. Your physician may prescribe a topical antibiotic to use once or twice a day under your sunscreen. Rubbing the face tends to irritate the reddened skin. Some cosmetics and hair sprays may also aggravate redness and swelling. Facial products such as soap, moisturizers, and sunscreens should be free of alcohol or other irritating ingredients. Moisturizers should be applied very gently after any topical medication has dried. When going outdoors, sunscreens with an SPF of 15 or higher are needed. Telangiectasias are the small blood vessels that arise on the surface of the skin, commonly on around the nose, cheeks, and chin. Simple cover-up makeup can be used for the telangiectasias. There are some green-based moisturizers or tinted foundations that may help conceal the redness. Telangiectasias can also be medically treated in your physician’s office with a small electric needle, a laser, intense pulse light, or minor surgery to close off the dilated blood vessels. Usually, multiple treatments are required for best results and only a portion of the blood vessels may be improved with each treatment. Not everyone responds the same to these types of treatments, and your physician can help you decide which treatment is best for your skin type, condition, and size of blood vessels. Rhinophyma of the nose is frequently treated by surgery. The excess tissue may be removed with a scalpel, laser, or electro surgery. Dermabrasion can help improve the look of the scar tissue. Follow-up treatments with laser or intense pulsed light may help lessen the redness. Medical maintenance therapy with oral and or topical antibiotics may be useful to decrease the chance of recurrence. Rosacea may affect your life minimally, moderately, or severely depending on how active the condition is and your overall tolerance of the skin symptoms. Some people have absolutely no symptoms and are not bothered at all by their rosacea. They may enjoy perfectly healthy normal lives without any effect from this benign skin condition. Some patients really like the pink glow to their cheeks and find it gives them a pleasant color without having to use blush. They may not even know they have rosacea. They usually do not want to use any treatment. People with moderate rosacea may have periodic flares that require treatment with oral antibiotics, lasers, and other therapies. They may continuously take an antibiotic daily for years and years to keep their symptoms under control. Many of these people may complain of embarrassment from the flushing and blushing of rosacea. They may have ups and downs and times that their disease is quiet and other times when it feels like it is on fire. With the help of their physician, these patients can learn the pattern of their rosacea and develop a treatment plan to keep it from interfering in their daily lives. Other patients have very bothersome rosacea that causes them issues on a daily basis. There are subsets of severe rosacea sufferers who have extreme psychological, social, and emotional symptoms. Some have developed social phobias causing them to cancel or leave situations when their rosacea is flaring or active. Some patients complain of looking like they have been drinking alcohol when in fact they don’t drink at all. Although rosacea is not a grave medical situation, severe cases may wreak havoc in some patient’s lives. It is important for these patients to discuss their physical and emotional concerns with their physicians and to get professional help in treating their rosacea. Overall, promptly diagnosed and properly treated, rosacea should not prevent people with the condition from enjoying long and productive lives. For more information on rosacea, you may wish to contact The National Rosacea Society (NRS) at www.Rosacea.org or 1-888-no blush. Support information and research updates may be regularly available from NRS. NRS also sponsors research grants and studies on rosacea treatment. Additional information is available from the American Academy of Dermatology at www.aad.org. Names of U.S. board certified dermatologists are available on this website. While online chat groups are available on www.yahoogroups.com and www.rosacea-support.org, these should not replace the advice of your physician. Online public posts and comments may not be scientifically or medically accurate and should be evaluated cautiously. Rosacea is a common, chronic, incurable, adult, acne-like skin condition. It has periodic ups and downs (flares and remissions). Rosacea symptoms tend to come and go. It is easily controllable and medically manageable. Rosacea may begin with easy facial blushing or flushing. Rosacea commonly affects the central third of the face, especially the nose. Rosacea causes tiny red pimples and fine red lines on the facial skin. Rosacea may be mistaken for rosy cheeks, sunburn, or quite often, acne. Rosacea triggers include alcohol, hot or spicy foods, emotional stress, and heat. Rosacea can be a very bothersome and embarrassing condition. Untreated rosacea tends to worsen over the time and be a progressive disease. Rosacea untreated can cause a bulbous red nose (like W.C. Fields). Prompt recognition and proper treatment permit people with rosacea to enjoy life. • Is rosacea like acne? • What are the signs and symptoms of rosacea? • What happens to the nose? • What happens to the eyes? • How is rosacea cured? • What about using acne medicine? • What is used for rosacea? • What should be avoided? • How should I care for the skin of my face? 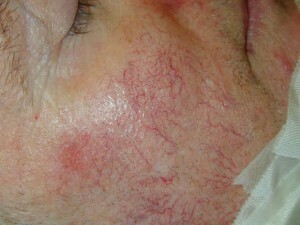 • How are the telangiectasias (the red lines) treated? • How is a rhinophyma (the W.C. Fields nose) treated? • What effect may rosacea have on my life? Rosacea ( roz-ay-sha) is a very common benign skin disorder that affects many people worldwide. As of 2008, it is estimated to affect at least 14 million people in the United States alone. The main symptoms of this facial condition include red or pink patches, visible broken blood vessels, small red bumps, red cysts, and pink or irritated eyes. Most people with the disease may not even know they have rosacea or that it is a diagnosable and treatable condition. Many patients may just assume they blush easily or have gotten sunburned. It is considered a chronic (long term), non-curable skin disease with periodic ups and downs. As opposed to traditional acne, most adult patients do not “outgrow’ rosacea. It is very characteristic in the central region of the face, causing persistent redness or transient flushing over the areas of the face and nose that normally blush — mainly the forehead, the chin and the lower half of the nose. It is commonly seen in people with fair or light skin, and particularly in those of Irish and Scottish backgrounds. Some famous people with rosacea have included former President Bill Clinton and W.C. Fields. The redness, instigated often by flushing, may cause small blood vessels in the face to enlarge (dilate) and become more visible through the skin, appearing like tiny red lines (called telangiectasias). Continual or repeated episodes of flushing may result in inflammation, causing red bumps that resemble teenage acne. In fact, rosacea can frequently be mistaken for typical acne. Rosacea is also referred to as acne rosacea. Rosacea is basically different than acne, although the two can coexist. It is also called “adult acne”. Unlike common acne, rosacea is not primarily a plague of teenagers, but occurs most often in adults (ages 30 to 50), especially those with fair skin. Different than acne, there are usually no blackheads or whiteheads in rosacea. Furthermore, most teens eventually outgrow acne whereas patients with rosacea don’t generally outgrow it. Rosacea consists mostly of small red bumps that are not “squeezable” or extractable like blackheads. Rosacea patients tend to have a rosy or pink color to their skin as opposed to acne patients whose skin is usually less red. Rosacea strikes both sexes and potentially all ages.It tends to be more frequent in women, but more severe in men. It is very uncommon in children and it maybe very infrequently be seen in darker skin tones or black skin. Overall it is seen in light featured adults ages 30-50. The exact cause of rosacea is still unknown and remains a mystery. The basic process seems to involve dilation of the small blood vessels of the face. Suspected causes of rosacea include but are not limited to: genetic factors, genetics plus sun exposure, a mite sometimes found in hair follicles ( Demodex Folliculorum), the bacteria Helicobacter pylori (that is associated with stomach ulcers), gastrointestinal disease, and medications like vasodilators (that cause blood vessels to widen) have also been thought possibly to bring out rosacea. There seems to be a hereditary component in some people. Rosacea tends to affect the “blush” areas of the face, and is more common in people who flush easily. Additionally, a variety of triggers are known to cause rosacea to flare.. Emotional factors (stress, fear, anxiety, embarrassment, etc.) may trigger blushing and aggravate rosacea. A flare-up can be caused by changes in the weather like strong winds or a change in the humidity. Sun exposure and sun damaged skin is generally associated with rosacea. Exercise, alcohol consumption, emotional upsets, and spicy food are other well-known triggers that may aggravate rosacea. Many patients may also notice flares around the holidays, particularly Christmas and New Year’s. What are the signs and symptoms of rosacea?Typical signs and symptoms include facial flushing, redness, burning, red bumps, and cysts. The symptoms tend to come and go. The skin may be clear for weeks, months or years and then erupt again. Rosacea tends to evolve in stages, and typically causes inflammation of the skin of the face, particularly the forehead, cheeks, nose, and chin. When rosacea first develops, it may appear, then disappear, and then reappear. However, in time the skin may fail to return to its normal color and the enlarged blood vessels and pimples arrive. Rosacea may rarely reverse itself. It generally lasts for years and, if untreated, it tends to worsen. 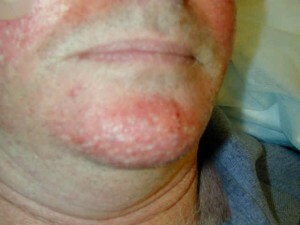 Although patients with rosacea may also have blackheads and whiteheads. acne does usually not cause the blackheads and whiteheads that are in common acne. What happens to the nose?The nose is one of the first areas to be affected in rosacea. It becomes red and bumpy and develops noticeable dilated small blood vessels. Left untreated, advanced stages of rosacea can cause a disfiguring nose condition called rhinophyma (ryno- fy-ma), literally growth of the nose, characterized by a bulbous, enlarged red nose and puffy cheeks (like the old comedian W.C. Fields). There may also be thick bumps on the lower half of the nose and the nearby cheek areas. Rhinophyma occurs mainly in men. Severe rhinophyma can require surgical repair. Some people falsely attribute the prominent red nose to alcoholics and this stigma can cause embarrassment to those with rosacea. Although a red nose may be seen in patients with heavy alcoholic use, not every patient with rosacea abuses alcohol. Rosacea may or may not affect the eyes. Not everyone with rosacea has eye issues. A complication of advanced rosacea, known as ocular rosacea, affects the eyes. About half of all people with rosacea report feeling burning, dryness, and grittiness of the eyes (conjunctivitis). These individuals may also experience redness of the eyelids and light sensitivity. Often the eye symptoms may go completely unnoticed and not a major concern for the individual. Many times the physician or ophthalmologist may be the first one to notice the eye symptoms and point it out to the rosacea patient. Untreated, ocular rosacea may cause a serious complication that can damage the cornea, called rosacea keratitis. An ophthalmologist can assist in a proper eye evaluation and prescribe rosacea eye drops. Untreated eye rosacea may cause permanent damage including impaired vision. There are some forms of rosacea that may be significantly cleared using laser, intense pulse light, photodynamic therapy, or isotretinoin.. Although still not considered a “ cure”, some patients experience long lasting results and may have remissions ( disease free period of time ) for months to years. There are other available treatments now that may also help achieve similar long term remissions of rosacea.What about using acne medicine? Since there is some overlap between acne and rosacea, some of the medications may be similar. Acne and rosacea have in common several possible treatments including ( but not limited to) oral antibiotics, topical antibiotics, sulfa based face washes, isotretinoin ( Accutane), and many others. It is important to seek a physician’s advice before using random over-the-counter acne medications since they can irritate rosacea prone skin. Overall, rosacea skin tends to be more sensitive and easily irritated than regular acne prone skin. What is used for rosacea? There are many treatment choices for rosacea depending on the severity and extent of symptoms. Available medical treatments include antibacterial washes, topical creams, antibiotic pills, lasers, pulsed light therapies, photodynamic therapy, and isotretinoin (Accutane) to list a few. Oral antibiotics are also commonly prescribed to patients with moderate rosacea. Tetracycline, doxycycline, minocycline, and amoxicillin are among the many oral antibiotics commonly prescribed to help reduce inflammation and pimples in rosacea. The dose may be initially high and then be tapered to maintenance levels. Common side effects and potential risks should be considered before taking oral antibiotics. Short-term topical cortisone (steroid) preparations of minimal strength may in occasional cases also be used to reduce local inflammation. There is a risk of causing a rosacea flare by using topical steroids. Some doctors may prescribe tretinoin (Retin-A) or isotretinoin (Accutane), prescription medications also used for acne, or permethrin (Elimite) cream, which is used for the mites that cause scabies. In addition, prescription or over the counter sensitive skin cleansers may also provide symptom relief and control. Harsh soaps and lotions should be avoided whereas simple and pure products such as Cetaphil or Purpose gentle skin cleanser may be less irritating. Patients should avoid excessive rubbing or scrubbing the face. Many patients are now turning to laser and intense light treatments to treat the continual redness and noticeable blood vessels on the face, neck, and chest. Often considered a safe alternative, laser and intense pulse light therapy may help to visibly improve the skin and complexion. Laser treatment may cause some discomfort. While most patients are able to endure the procedure, ice packs and topical anesthetic cream can help alleviate the discomfort. Multiple treatments are typically necessary and the procedure is not covered by most insurances. Treatments are recommended in 3-6 week intervals; during this time sun avoidance is necessary. Risk, benefits and alternatives should be reviewed with your physician prior to treatment. Laser treatments may be combined with photodynamic therapy ( light activated chemical using Levulan) for more noticeable results. Photodynamic therapy (PDT) is one of the newly available treatments. PDT uses a topical photosensitizer liquid that is applied to the skin and a light to activate the sensitizer. Typically, Levulan (aminolevulonic acid) and blue light, commonly used to treat pre-cancers (actinic keratosis) and acne vulgaris, can also be used to treat some rosacea patients. The use of PDT in rosacea is considered off label use to some extent since it is primarily designed for regular acne. PDT is thought to work at reducing the inflammation, pimples, and also improving the skin texture. PDT is an in-office procedure performed in your physician’s office. The treatment takes anywhere from 1 to 1 ½ hours to complete. Strict sun avoidance for approximately one to three days is required after the treatment. Mild discomfort during the treatment and a mild to moderate sunburn appearance after the treatment is common. Some patients have experienced remissions( disease free periods) of several months to years from these types of treatments. Other patients may not notice significant improvement. Your physician can help you decide if this treatment can help your type of rosacea. Glycolic acid peels may additionally help to improve and control rosacea in some patients. The chemical peels can professionally be applied for approximately 2-5 minutes every two to four weeks. Mild stinging, itching, or burning may occur and some patients experience peeling for several days after the peel. Any peel may irritate very sensitive skin and cause flares for some patients. Sun exposure is a known flare for some rosacea sufferers. Sun protection using a wide brimmed hat and sunscreens are generally encouraged. Because rosacea tend to occur in mostly fair skinned adults, the use of an appropriate daily sunscreen lotion and overall sun avoidance is recommended. Zinc based sunscreens (SPF 30 or higher) may provide adequate sun protection. While not all rosacea patients are exactly the same, there are some commonly described rosacea triggers. Avoiding these potential triggers may also help relieve symptoms and disease flares. Smoking, spicy foods, hot drinks, and alcohol may cause flushing and should be avoided. Exposure to sunlight and to extreme hot and cold temperatures should be limited as much as possible . Potent cortisone medications on the face should be avoided because they can promote widening of the tiny blood vessels of the face. Some patients experience severe rosacea flares after prolonged use of topical steroids. Proper skin care involves using a gentle cleanser to wash the face twice a day. Over washing may cause irritation. A sunscreen lotion is advisable each morning. Your physician may prescribe a topical antibiotic to use once or twice a day under your sunscreen. Rubbing the face tends to irritate the reddened skin. Some cosmetics and hair sprays may also aggravate redness and swelling. Facial products such as soap, moisturizers and sunscreens should be free of alcohol or other irritating ingredients. Moisturizers should be applied very gently after any topical medication has dried. When going outdoors, sunscreens with an SPF of 15 or higher are needed. Telangiectasias are the small blood vessels that arise on the surface of the skin, commonly on around the nose, cheeks, and chin.Simple cover-up make up can be used for the telangiectasias. There are some green based moisturizers or tinted foundations that may help conceal the redness. Telangiectasias can also be medically treated in your physician’s office with a small electric needle, a laser, intense pulse light, or minor surgery to close off the dilated blood vessels. Usually, multiple treatments are required for best results and only a portion of the blood vessels may be improved with each treatment. Not everyone responds the same to these types of treatments and your physician can help you decide which treatment is best for your skin type, condition, and size of blood vessels. How is a rhinophyma (the W.C. Fields nose) treated?Rhinophyma of the nose is frequently treated by surgery. The excess tissue may be removed with a scalpel, laser or electro surgery. Dermabrasion can help improve the look of the scar tissue. Follow up treatments with laser or intense pulsed light may help lessen the redness. Medical maintenance therapy with oral and or topical antibiotics may be useful to decrease the chance of recurrence. Some patients have absolutely no symptoms and are not bothered at all by their rosacea. They may enjoy perfectly healthy normal lives without any effect from this benign skin condition. Some patients really like the pink glow to their cheeks and find it gives them a pleasant color without having to use blush. They may not even know they have rosacea unless someone tells them. They usually do not want to use any treatment. Then there are the people with moderate rosacea. These patients may have periodic flares that require treatment with oral antibiotics, lasers, and other therapies. They may continuously take an antibiotic daily for years and years to keep their symptoms under control. Many of these people may complain of embarrassment from the flushing and blushing of rosacea. They may have ups and downs and times that their disease is quiet and other times when it feels like it is on fire. With the help of their physician, these patients can learn the pattern of their rosacea and develop a treatment plan to keep it from interfering in their daily lives. Other patients have very bothersome rosacea that causes them issues on a daily basis. There are a subset of severe rosacea sufferers who have extreme psychological, social, and emotional symptoms. Some have developed social phobias causing them to cancel or leave situations when their rosacea is flaring or active. Some patients complain of looking like they have been drinking alcohol when in fact they don’t drink at all. Although rosacea is not a grave medical situation, severe cases may wreak havoc in some patient’s lives. It is important for these patients to discuss their physical and emotional concerns with their physicians and to get professional help in treating their rosacea. Overall, promptly diagnosed and properly treated, rosacea should not prevent persons with the condition from enjoying long and productive lives. • Rosacea is a common chronic skin disorder. • Rosacea begins innocently as a blush of the face. • The rosacea region is the central third of the face including the nose. • Rosacea causes tiny pimples and red lines appear on the skin. • Rosacea may be mistaken for rosy cheeks, sunburn or, quite often, acne. • Rosacea can be a very bothersome and embarrassing condition. • Rosacea untreated can cause a bulbous red nose (like W.C. Fields). • Prompt recognition and proper treatment permit people with rosacea to enjoy life. This booklet contains general information about rosacea (ro-ZAY-she-ah). It defines rosacea and describes its symptoms, possible causes, and treatments. If you have further questions after reading this booklet, you may wish to discuss them with your doctor. What Research Is Being Conducted to Help People With Rosacea? Where Can People Find More Information About Rosacea? Rosacea is a chronic (long-term) disease that affects the skin and sometimes the eyes. The disorder is characterized by redness, pimples, and, in advanced stages, thickened skin. Rosacea usually affects the face. Skin on other parts of the upper body is only rarely involved. Approximately 14 million people in the United States have rosacea. It most often affects adults between the ages of 30 and 60. Rosacea is more common in women (particularly during menopause) than men. Although rosacea can develop in people of any skin color, it tends to occur most frequently and is most apparent in people with fair skin. There are several symptoms and conditions associated with rosacea. These include frequent flushing, vascular rosacea, inflammatory rosacea, and several other conditions involving the skin, eyes, and nose. Frequent flushing of the center of the face, which may include the forehead, nose, cheeks, and chin, occurs in the earliest stage of rosacea. The flushing often is accompanied by a burning sensation, particularly when creams or cosmetics are applied to the face. Sometimes the face is swollen slightly. A condition called vascular rosacea causes persistent flushing and redness. 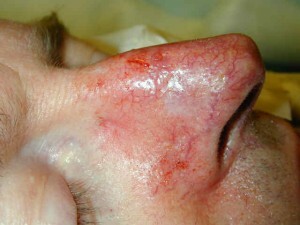 Blood vessels under the skin of the face may dilate (enlarge), showing through the skin as small red lines. This is called telangiectasia (tel-AN-je-ek-tay-ze-ah). The affected skin may be swollen slightly and feel warm. A condition called inflammatory rosacea causes persistent redness and papules (pink bumps) and pustules (bumps containing pus) on the skin. Eye inflammation and sensitivity as well as telangiectasia also may occur. In the most advanced stage of rosacea, the skin becomes a deep shade of red and inflammation of the eye is more apparent. Numerous telangiectases are often present, and nodules in the skin may become painful. A condition called rhinophyma also may develop in some men; it is rare in women. Rhinophyma is characterized by an enlarged, bulbous, and red nose resulting from enlargement of the sebaceous (oil-producing) glands beneath the surface of the skin on the nose. People who have rosacea also may develop a thickening of the skin on the forehead, chin, cheeks, or other areas. In addition to skin problems, up to 50 percent of people who have rosacea have eye problems caused by the condition. Typical symptoms include redness, dryness, itching, burning, tearing, and the sensation of having sand in the eye. The eyelids may become inflamed and swollen. Some people say their eyes are sensitive to light and their vision is blurred or otherwise impaired. Doctors do not know the exact cause of rosacea but believe that some people may inherit a tendency to develop the disorder. People who blush frequently may be more likely to develop rosacea. Some researchers believe that rosacea is a disorder where blood vessels dilate too easily, resulting in flushing and redness. Factors that cause rosacea to flare up in one person may have no effect on another person. Although the following factors have not been well-researched, some people claim that one or more of them have aggravated their rosacea: heat (including hot baths), strenuous exercise, sunlight, wind, very cold temperatures, hot or spicy foods and drinks, alcohol consumption, menopause, emotional stress, and long-term use of topical steroids on the face. Patients affected by pustules may assume they are caused by bacteria, but researchers have not established a link between rosacea and bacteria or other organisms on the skin, in the hair follicles, or elsewhere in the body. Although there is no cure for rosacea, it can be treated and controlled. A dermatologist (a medical doctor who specializes in diseases of the skin) usually treats rosacea. The goals of treatment are to control the condition and improve the appearance of the patient’s skin. It may take several weeks or months of treatment before a person notices an improvement of the skin. Some doctors will prescribe a topical antibiotic, such as metronidazole, which is applied directly to the affected skin. For people with more severe cases, doctors often prescribe an oral (taken by mouth) antibiotic. Tetracycline, minocycline, erythromycin, and doxycycline are the most common antibiotics used to treat rosacea. The papules and pustules symptomatic of rosacea may respond quickly to treatment, but the redness and flushing are less likely to improve. Some people who have rosacea become depressed by the changes in the appearance of their skin. People who have rosacea may experience low self-esteem, feel embarrassed by their appearance, and claim their social and professional interactions with others are adversely affected. A doctor should be consulted if a person feels unusually sad or has other symptoms of depression, such as loss of appetite or trouble concentrating. Doctors usually treat the eye problems of rosacea with oral antibiotics, particularly tetracycline or doxycycline. People who develop infections of the eyelids must practice frequent eyelid hygiene. The doctor may recommend scrubbing the eyelids gently with diluted baby shampoo or an over-the-counter eyelid cleaner and applying warm (but not hot) compresses several times a day. When eyes are severely affected, doctors may prescribe steroid eye drops. Electrosurgery and laser surgery are treatment options if red lines caused by dilated blood vessels appear in the skin or if rhinophyma develops. For some patients, laser surgery may improve the skin’s appearance with little scarring or damage. For patients with rhinophyma, surgical removal of the excess tissue to reduce the size of the nose usually will improve the patient’s appearance. Keeping a written record of when flares occur may provide clues about what is irritating the skin. Most people should use a sunscreen every day that protects against UVA and UVB rays (ultraviolet rays) and has a sun-protecting factor (SPF) of 15 or higher, but sunscreen is particularly important for people whose skin is irritated by exposure to the sun. Using a mild lubricant may be helpful, but avoid applying any irritating products to the face. Some people find that a green-tinted makeup effectively conceals skin redness. If your eyes are affected, faithfully follow your doctor’s treatment plan and clean your eyelids as instructed. Researchers are studying the eyes of people who have rosacea to find ways to prevent dry eyes and other eye problems related to rosacea. Scientists also are evaluating the most effective ways to use medications to treat rosacea and the best methods to minimize scarring of the sebaceous glands when removing excess nasal tissue in rhinophyma. Additionally, researchers are looking at the immunological aspects of rosacea. In one study, researchers found that people with rosacea had high levels of cathelicidins, peptides with antimicrobial and proinflammatory properties that protect the skin against infection. (Cathelicidins are secreted in an inactive form and undergo a cleaving process to take on their active form.) Investigators also discovered that levels of stratum corneum tryptic enzyme or SCTE—the enzyme responsible for cleaving the inactive cathelicidins into their active form—were also elevated in people with rosacea. For additional contact information, visit the NIAMS Web site, or call the NIAMS Information Clearinghouse. NIAMS gratefully acknowledges the assistance of Mark Dahl, M.D., Mayo Clinic, Scottsdale, AZ; Sam Huff, National Rosacea Society, Barrington, IL; Robert Katz, M.D., Rockville, MD; M. Carol McNeely, M.D., University Dermatology Associates, Washington, DC; Larry Miller, M.D., Chevy Chase, MD; Alan Moshell, M.D., NIAMS, NIH; and Gary Peck, M.D., Washington Hospital Center, Washington, DC, in the review of this booklet. The mission of the National Institute of Arthritis and Musculoskeletal and Skin Diseases (NIAMS), a part of the U.S. Department of Health and Human Services’ National Institutes of Health (NIH), is to support research into the causes, treatment, and prevention of arthritis and musculoskeletal and skin diseases; the training of basic and clinical scientists to carry out this research; and the dissemination of information on research progress in these diseases. The National Institute of Arthritis and Musculoskeletal and Skin Diseases Information Clearinghouse is a public service sponsored by the NIAMS that provides health information and information sources. Additional information can be found on the NIAMS Web site at www.niams.nih.gov. This booklet contains information about medications used to treat the health condition discussed here. When this booklet was printed, we included the most up-to-date (accurate) information available. Occasionally, new information on medication is released. This booklet is not copyrighted. Readers are encouraged to duplicate and distribute as many copies as needed. 7 Completed A Phase II, Randomized Study of ACZONE™ (Dapsone) Gel, 5% for Papulopustular Rosacea.